Burnout is never caused by a single area of life. Burn out is a function of our total life management. One area of life cannot get out of order without overt choices of neglect being made other areas of life. This means that if we managed the others areas of our life well, it would have contained the area (i.e., work, ministry, parenting, etc…) that was the primary cause of burnout. We must resist the temptation to blame life, or even one area of our life management, for the experience of burnout. Burnout is a result of how we have managed our life as a whole. So we might begin our assessment of burnout’s cause with this foundational statement—burnout is the result of living beyond our means with the time God has provided. It is common to say that someone is “living beyond their means” financially. There is a cultural epidemic of people spending more than they earn. The majority of Americans have a negative net-worth; we owe more than we own. We will use this parallel of financial and time management many times, so begin to think in these categories. 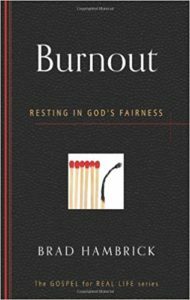 The first thing God’s fairness requires of the person moving towards burnout is to rest in the fact that everything fits in a 168 hour week. This means that even if there are 200 hours worth of excellent things to be accomplished in a week, that you can have assurance at least 32 hours of your agenda is outside the will of God for your life; not “outside the will of God” in terms of being bad, but “outside the will of God” in the sense that God will accomplish this, if it needs to be done, through someone else. In my booklet Burnout: Resting in God’s Fairness there is a “time budget tool.” Here is a printable version of the blank and overdrawn sample of this resource. Here is presentation on the subject of burnout based upon my booklet on this subject. Burnout from Equip on Vimeo. If this post was beneficial for you, then consider reading other blogs from my “Favorite Posts on Emotions” post which address other facets of this subject.